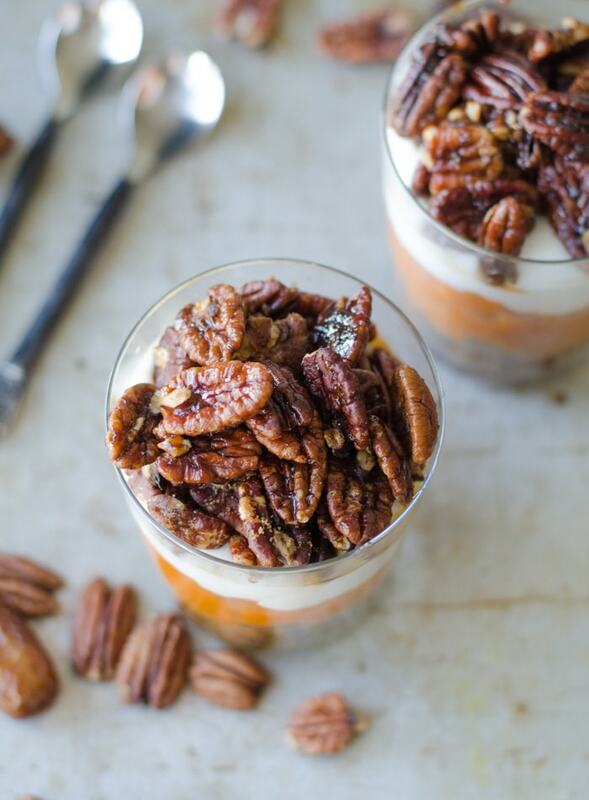 Say hey to vegan pumpkin pie parfaits with candied pecans. These beautiful pumpkin cups make a simple and delicious alternative to traditional pumpkin pie. 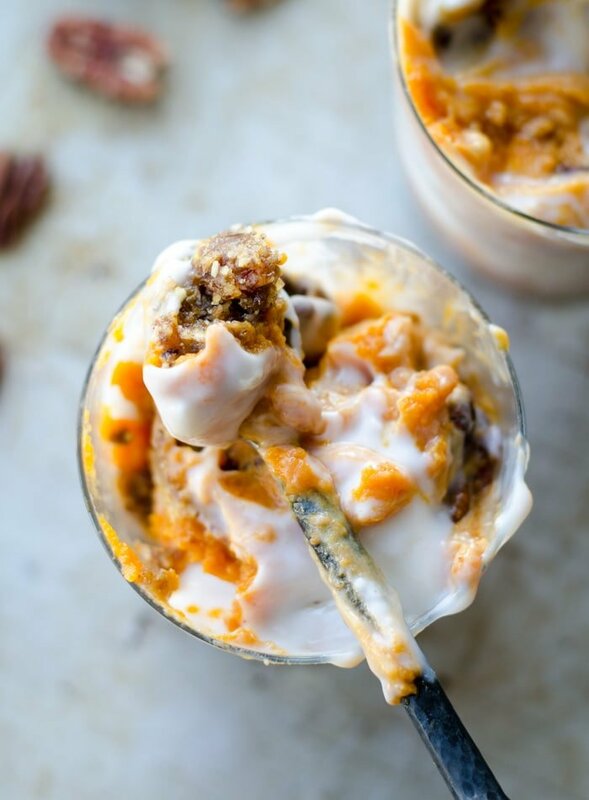 They’re incredibly decadent but made with wholesome ingredients like raw pecans, dates, coconut milk, non-dairy yogurt and pumpkin. 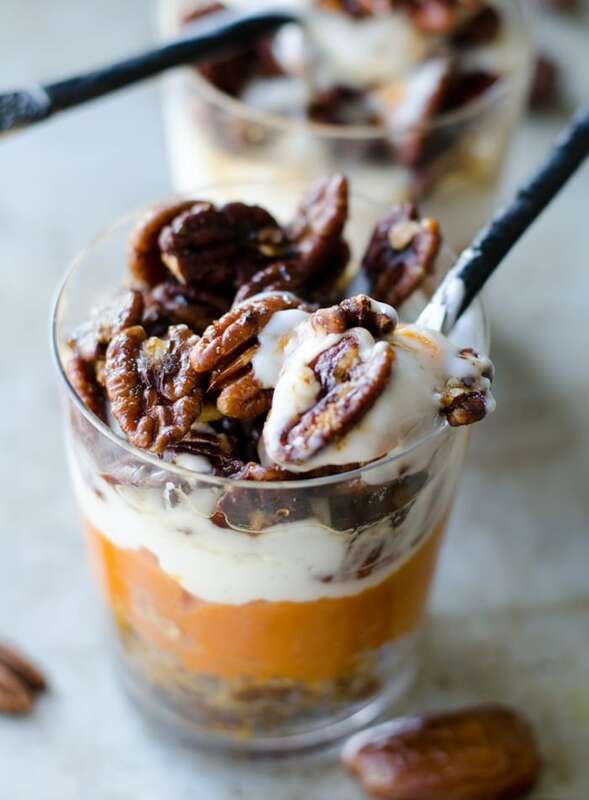 If you don’t feel like making the candied pecans, the pumpkin pie mousse is amazing just on it’s own or topped with whipped cream, caramel sauce, dark chocolate, chopped nuts or granola. To make the vegan pumpkin pie mouse you’ll need to place a can of full-fat coconut milk in the fridge overnight. This will cause the thick coconut cream to separate from the liquid so you can scoop it out and use it in in this recipe. Other than pumpkin and coconut milk, all you’ll need is maple syrup and a few spices to create that pumpkin pie flavour You can use pumpkin pie spice or a combination of cinnamon, ginger and nutmeg, plus optional cloves and allspice. If you’re in a pinch and don’t any coconut cream, you can just use pumpkin and sweetener. It won’t be quite as firm but it will still taste great! To make a quick raw pie crust for the bottom of the parfaits, I simply blended dates, pecans and sea salt then crumbled it into the bottom of each cup. These pecans have become a problem…as in they’re too freakin’ good and they’re too easy to make. 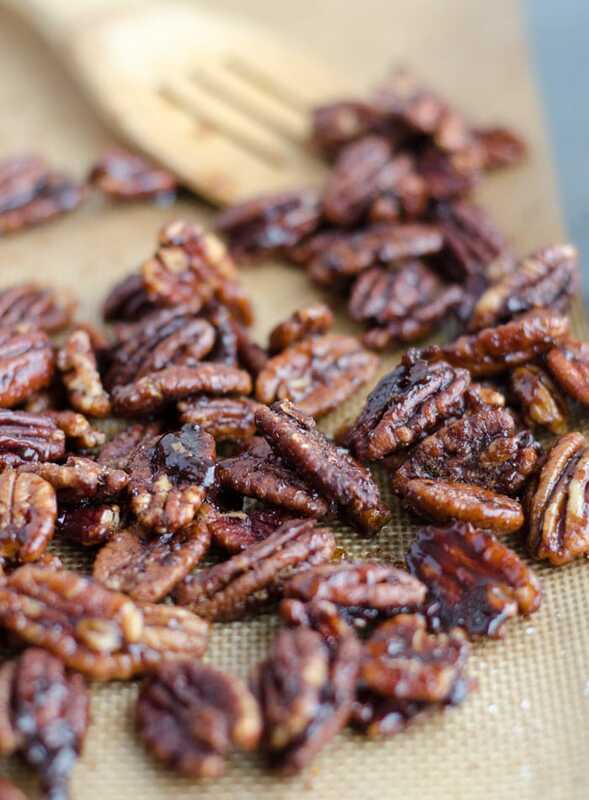 To make them all you need to do is spread some pecans on a baking sheet lined with parchment paper or a silicone mat, coat them with the rest of the ingredients and bake to perfection. They’ll get coated with maple syrup, coconut oil, cinnamon, sea salt and coconut sugar so they’re sweet and salty, ooey and gooey and just taste incredible. They’ll be soft when they come out of the oven but as they cool they’ll get nice and crunchy. Feel free to double or triple the recipe to make a bigger batch to package into homemade gifts. Pumpkin pie crust crumble. Blend up pecans, dates and sea salt and crumble away. 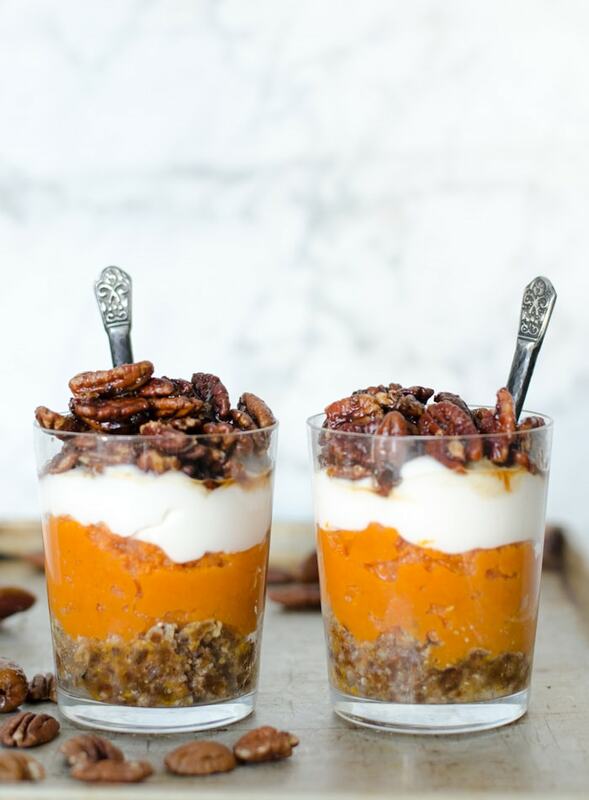 No-bake pumpkin pie mousse. Made from pumpkin, coconut cream, maple syrup, cinnamon, ginger and nutmeg, this layer tastes just like pumpkin pie. Non-dairy yogurt in plain or vanilla. I loved it with plain to balance the sweet crust and pumpkin. You can also use coconut shipped cream if you want to get extra fancy! I’ve made this with coconut whipped cream but that will require two cans of coconut milk and some extra time and effort to whip. You could also do an aquafaba whipped cream but I wasn’t too crazy about the texture when I tried it but it’s an easy option if you need it! I actually preferred this with the dairy-free yogurt though. It was lighter and I liked the tanginess from using plain yogurt. You can use homemade or store-bought coconut, cashew, almond or soy yogurt in plain or vanilla. I used plain Yoso Coconut Yogurt and it was perfect. 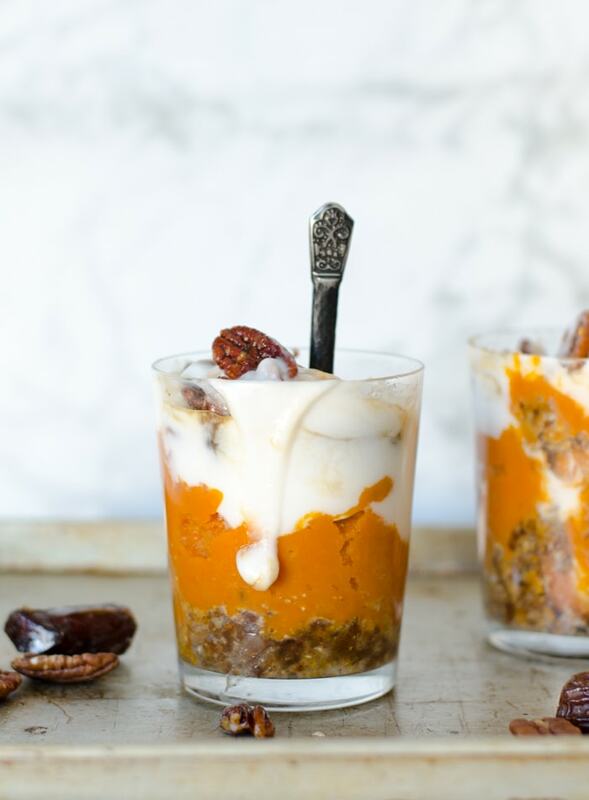 I didn’t create a layered parfait for the photos so if you want to get fancy, do a double layer of pumpkin and yogurt. You could go pumpkin, yogurt, pumpkin or do two alternating laters of each. That would look so pretty! You can serve these in small cups like I did but ramekins or small bowls also work. If you don’t feel like layering, just throw everything in a bowl and serve, it will still taste amazing! This decadent but wholesome dessert makes a fun and delicious option to traditional pumpkin pie. 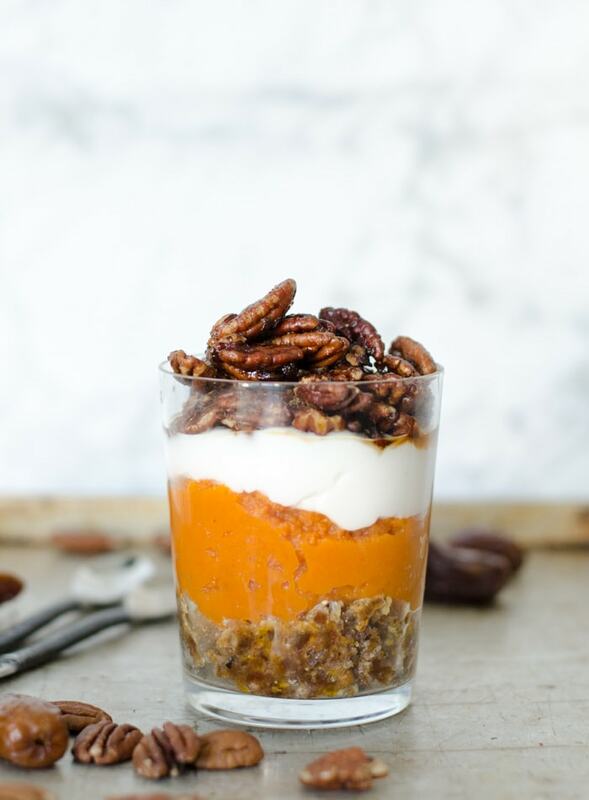 The pumpkin pie mousse is made with pumpkin, maple syrup and it’s layered with a pecan date crumble, dairy-free yogurt and baked candied pecans. Place the pecans on a silicone mat or parchment paper lined baking sheet. Add 2 tsp coconut oil, 1 tbsp maple syrup and a sprinkling of coconut sugar, cinnamon and sea salt. Bake for 20 minutes, flipping once half way through. When they come out of the oven, mix with the other tbsp of maple syrup and sprinkle with additional sea salt, cinnamon and coconut sugar. Serve immediately or let cool completely before storing in an air-tight container. Add the dates, pecans and sea salt to a blender or food processor and pulse to combine. You want a thick, gooey dough consistency. Divide between 4 serving cups, bowls or ramekins and set aside. Add the pumpkin and maple syrup to a blender or food processor. Scoop the thick coconut cream out of the can of coconut milk that was in the fridge overnight and add that as well. Add the spices and blend to combine. Scoop over the 4 servings of crumble layer. Add a layer of non-dairy yogurt on top of the pumpkin layer, top with the pecans and serve right away. These are awesome when the candied pecans are still warm but everything can be made in advance if needed. If making in advance, store each portion separately until ready to serve. The candied pecans can be stored in an air-tight container once they’re cool, the crumble and pumpkin mousse should be stored in the fridge. For the coconut cream, place 1 can of full-fat coconut milk in the fridge overnight then carefully open and scoop out the separated cream. 1 can of coconut milk should yield about a 1/2 cup of coconut cream. Alternatively, you can use store-bought coconut cream.